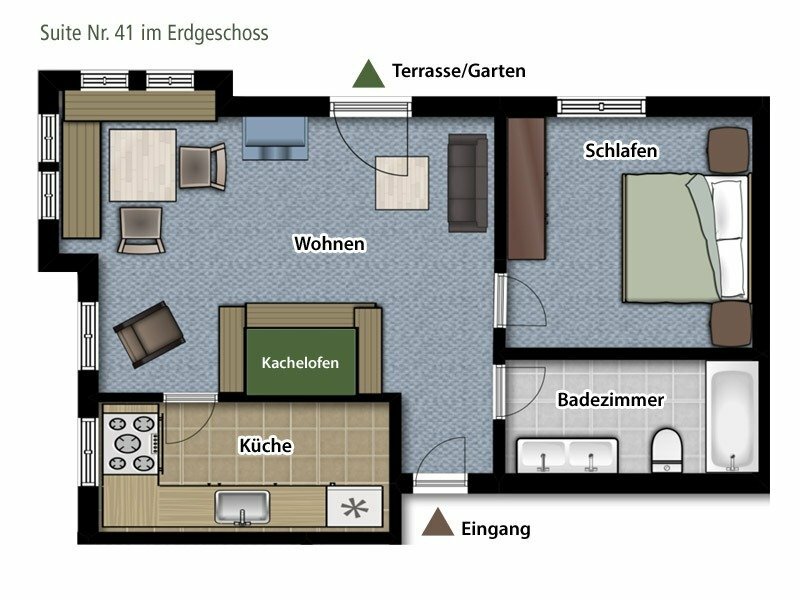 Enjoy peace and comfort in your very personal, Bavarian home on time. 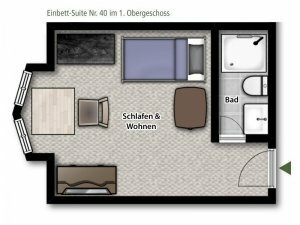 Single-bed suite with approx. 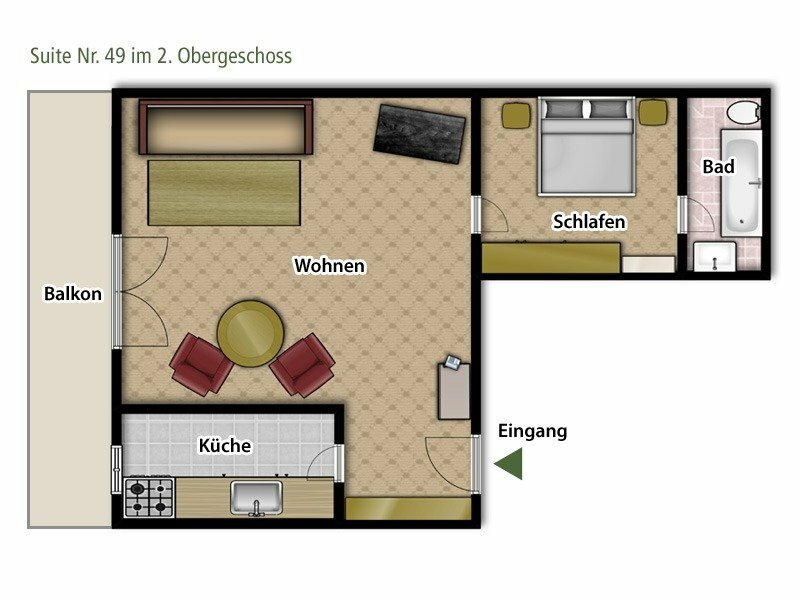 18 m², with shower / WC, minibar, flatscreen TV, telephone, safe, radio, bay window with view to the Wallberg – without balcony. A large cozy bed with back-friendly mattress offers space for one person. Bathroom with shower, hairdryer and fluffy bathrobe and bath shoes for the duration of the stay. Suite with approx. 65 m², living room, bedroom, kitchen, fireplace, minibar, flat screen TV, telephone, WLAN, safe, radio, and balcony or terrace to the garden. Price for 2 persons / day including breakfast. 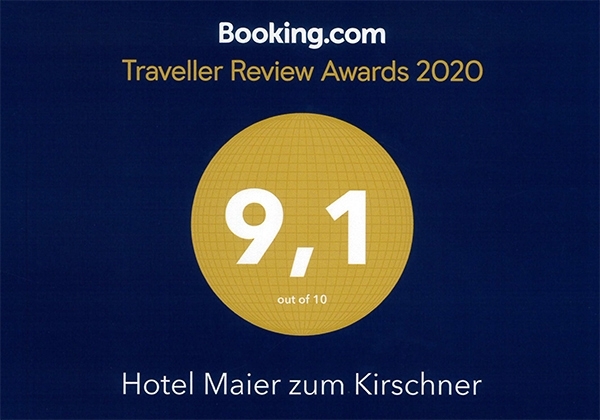 A large comfortable double bed with back-friendly mattress can accommodate two people. 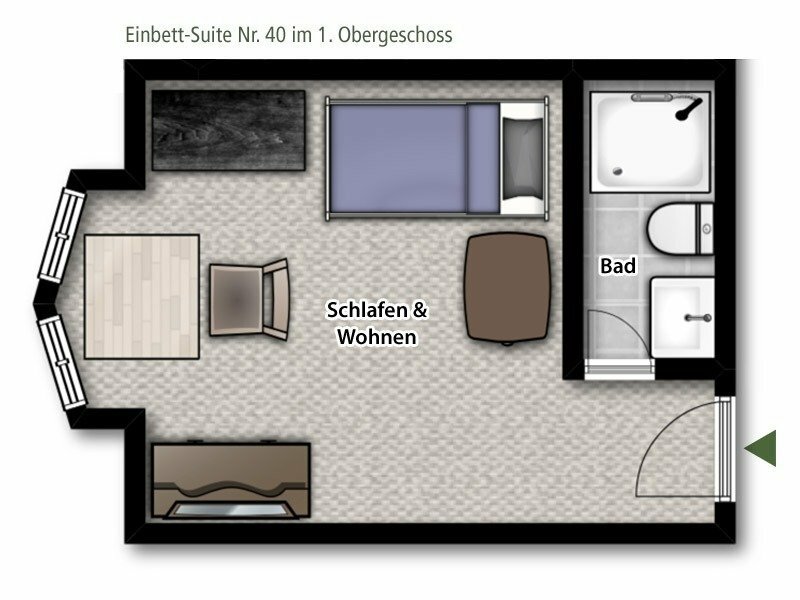 Bathroom with tub and/or shower, double sinks, hairdryer, bathrobe and bath shoes. Suite with approx. 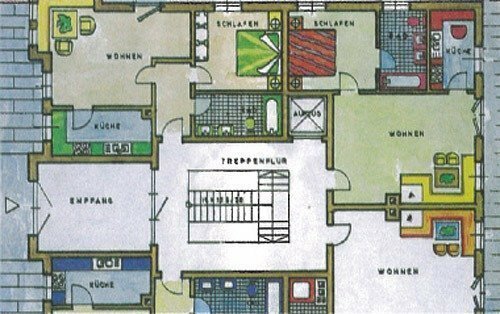 55 m², a living room with a built-in alcove, a bedroom, a kitchen, fireplace, a bathroom with bath or shower and a large balcony with a view of the Wallberg. Price for 2 persons / day. A large comfortable double bed with back-friendly mattress can accommodate two people. A built-in alcove can accommodate 1 additional person. Bathroom with bathtub, hairdryer and fluffy bathrobe and bath shoes for the duration of the stay. Suite with approx. 75 m², a living room with 2 built-in beds, a bedroom, a kitchen, fireplace, bathroom with bathtub or shower and a large balcony with a view of the garden. Price for 2 persons / day. A large comfortable double bed with back-friendly mattress can accommodate two people. Two built-in alcoves can accommodate 2 additional persons. Chalet with approx. 30 m² in the hotel gardens. With comfortable furnishing and modern conveniences: flat screen, mini-bar, tiled stove … everything available, what your holiday heart desires to feel good. Price for 2 persons / day. Bathroom with shower, sink, toilet, hairdryer and fluffy bathrobe and bath shoes for the duration of the stay.